All of us loved this trip very much. It is something that is going to stay with us forever. It was an opportunity to bond with each other, with Dianna, and at the same pursue an activity that we both like. It was an adventure from which all of us learned a lot. 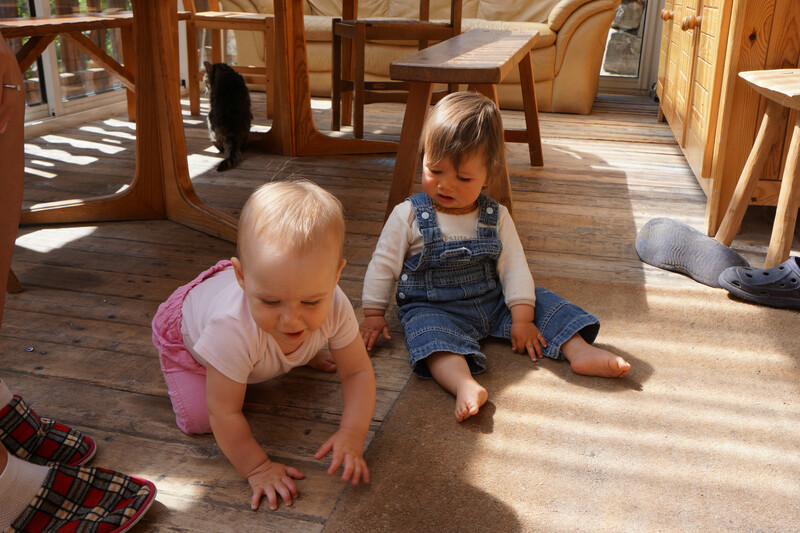 We supported each other, shared baby duties, planned our days together. It was an escape from the usual baby routine. Before we set off we thought that the routine will bring in a hassle, but far from that, it brought joy. We were thinking about doing another trip and decided to plan an long trip, a trip that we won’t be able to do once Dianna reaches school age (at least not for another 18 years from that point). First we were thinking about crossing the Americas. This idea quickly became moot as I am still unable to get a visa into the United States. The obvious alternative is to cross Eurasia, starting at London and finishing somewhere in Southeast Asia. It is much safer than crossing the Americas (Northern South America as well as Latin America is not considered safest cycling destinations) and the distance is substantially shorter. We plan to attempt this once Anna is done with her studies at Westminster Uni. 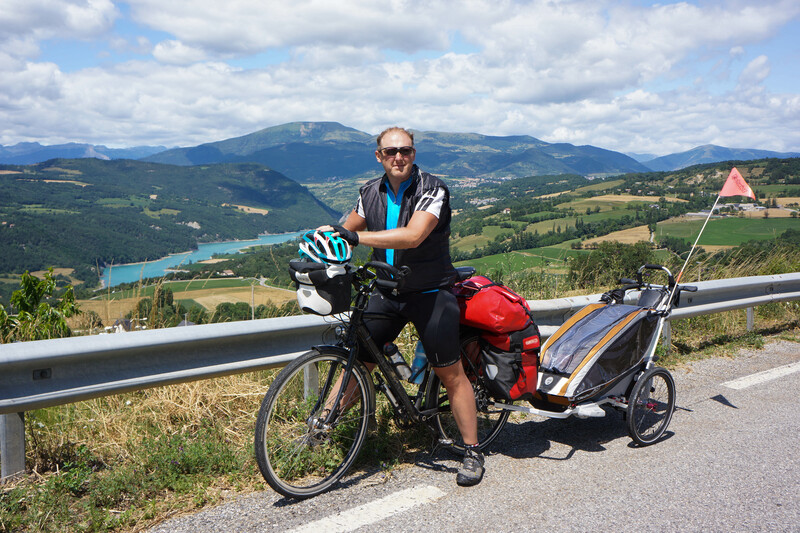 We are planning to cycle from London via France and Switzerland to Brindisi in Italy, cross the Adriatic into Greece and continue via Turkish interior towards Georgia and Azerbaijan. This part of the trip should take around 3 – 3.5 months. Leaving in June we should make it to Baku in mid-September, leaving 2 more months until Central Asian winter kicks in. From Baku we plan to take a ferry to Atyrau in Kazakhstan and cycle 400km towards a station along the Kazah – Uzbek railroad where we are to take a train through the Kara khoum desert to Namangan in Uzbekistan. From there we plan to cycle to Tashkent, through Bukhara and Samarkand. In October/November it will be getting cold in the region and passes should be snowed in, making it impossible to continue. We will either stay in Tashkent or go back to the UK until Spring kicks in the April. In April, we will continue towards Osh in Kyrgizstan and cross the Tiang-Shan mountains into China, descending to Kashgar where we will board a train to Urumqi (I can’t imagine tackling 800km of desert with a child, maybe I will by the time we are there). From Urumqi we plan to cycle towards Chengdu in Sichuan and then to Kunming in Yunnan province. In Kunming we will decide upon where the finish line will be, depending on the month that we get there. If we get there early enough we might continue through Laos to Thailand, if not, we will finish up in Hanoi/North Vietnamese coast. We are looking for another crazy family to join us on this 😉 We are not certain on the plan and we can still make adjustments in terms of the route and departure times. We believe that it will be more fun if 2 families will be doing this at the same time. Safety-wise it would also be better for the group to be at least 4 adults of more. If interested contact us via the Blog! 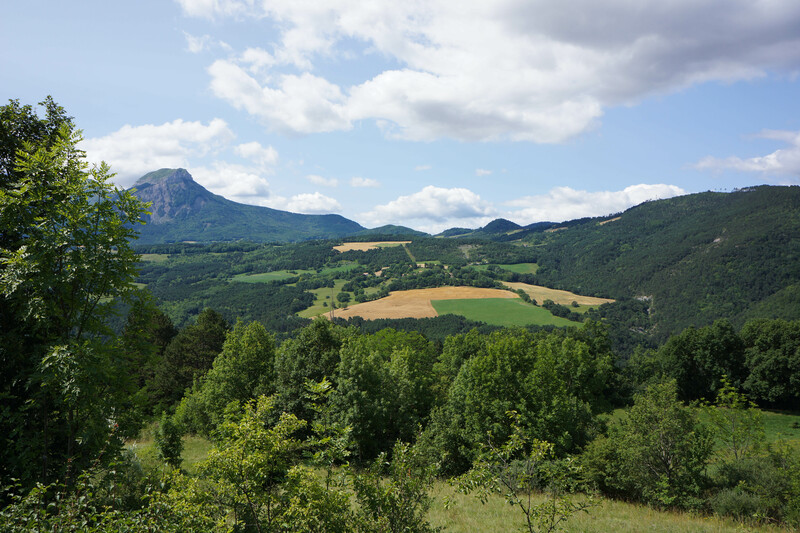 Today we started ascent of the Col de Coyolle, the highest point of our trip. 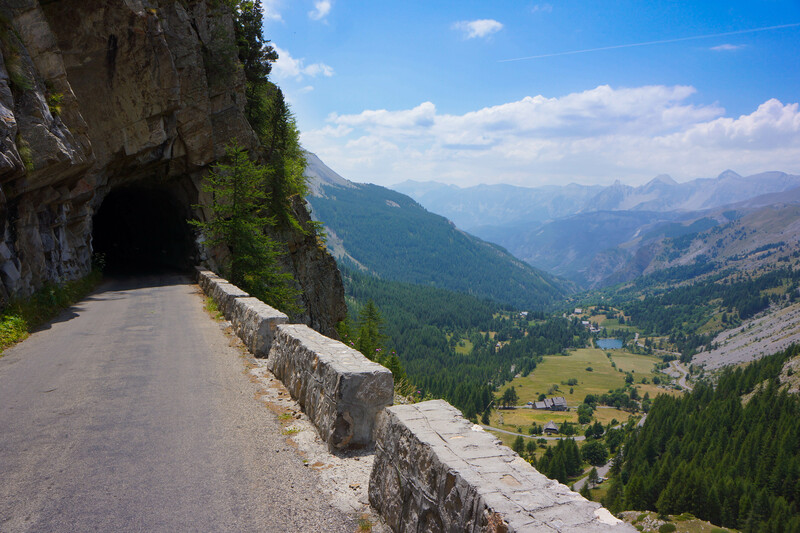 The road from Barcelonette to the Col is 30km long and rises 1250 meters to 2326 meters in altitude. With approximately 40 kilos of weight attached to by bike there is no way I could make it to the top in one go. 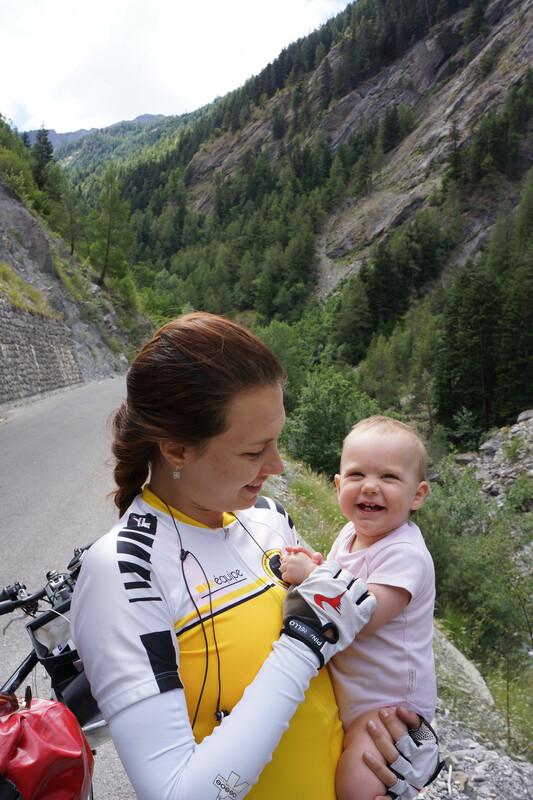 We decide to spend a night halfway up, in the small hamlet of Bayasse, 20km into the climb at the altitude of 1800 meters. The road to Bayasee is remarkably beautiful. 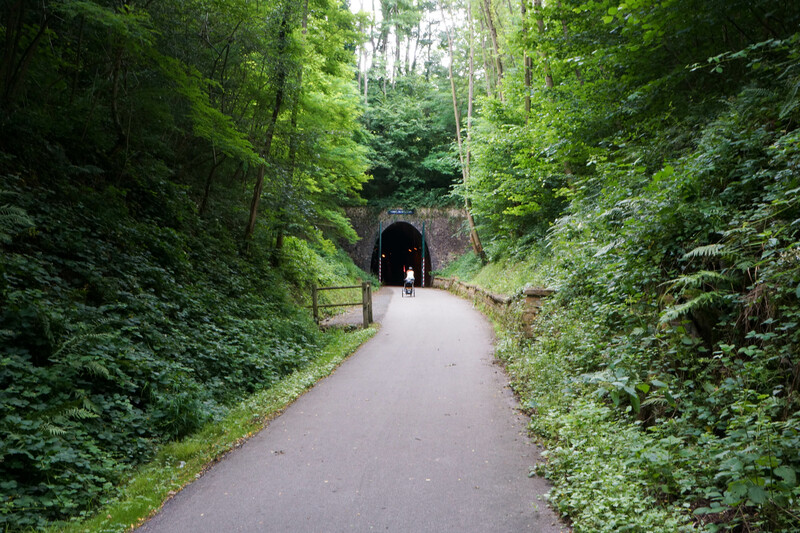 For the first 15km it follows the spectacular Gorge of the Blanchard river, rising very gently 600 meters over 20km and thus allowing us to enjoy the scenery without pushing the pedals up 6-8% slopes. Once pass 1400 meters, the air started to cool down considerably. It must be not more than 15 degrees (30C in Barcelonette). We stop at the first village, St. Villard for drinks. Dianna dips her little feet in the village fountain (coooooold!). Towards the pass the road is getting steeper, the air thinner and cooler. 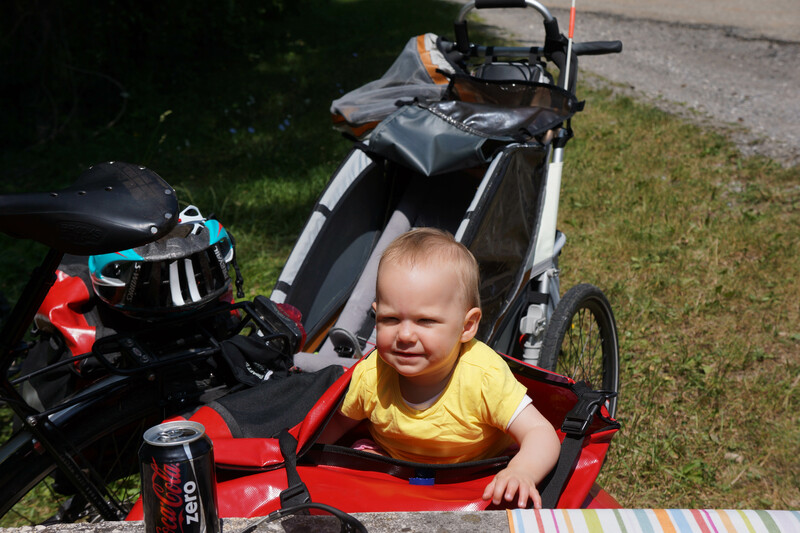 Arriving at Bayasse exhausted at around 4pm we find a Gite ran by a family of three with a 10 month old boy! Dianna is happy to see another baby, she loves babies. Also resident are two dogs and several cats. Our room is a for 4 people, but luckily, we are the only ones in it. Shower and toilet are shared with other guests of the Gite, who soon arrive (a group of French walkers, very noisy and 4 Italians traveling from Italy on horseback). We sit down outside to have dinner with the Italians. They are from Piemonte and speak Piemontese, a very weird mix of French, Spanish, Catalan and Italian. Criticizing awful French vine offered by the hosts they offer their own, Barbera d’Alba, which is excellent compared to anything we’ve tried in France. After a fruitful day in Le Lauzet, first 2 day stay in one place that was really fun, we left for Barcelonette. 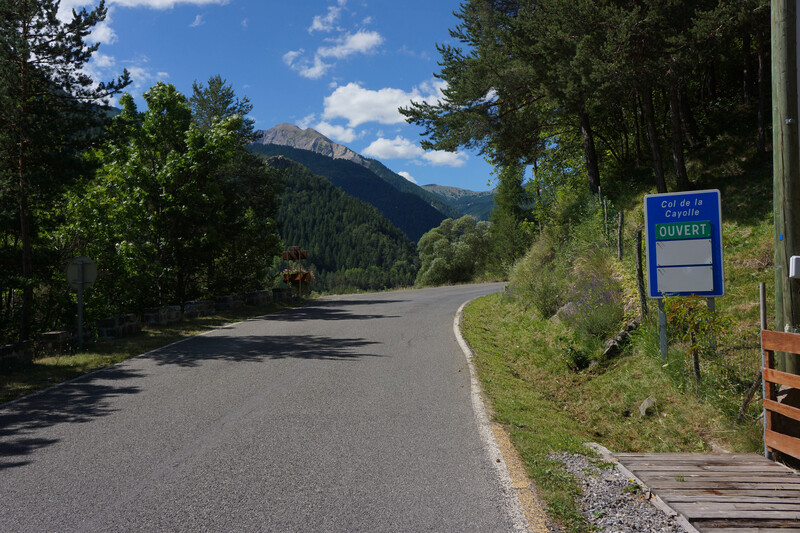 The road followed Ubaye river and was only slightly undulating while offering dramatic scenery of the Ubaye river valley and the surrounding mountains. With a very strong tailwind we made it to Barcelonette in under 2 hours, which is quite good taking a 250 meter climb into account. 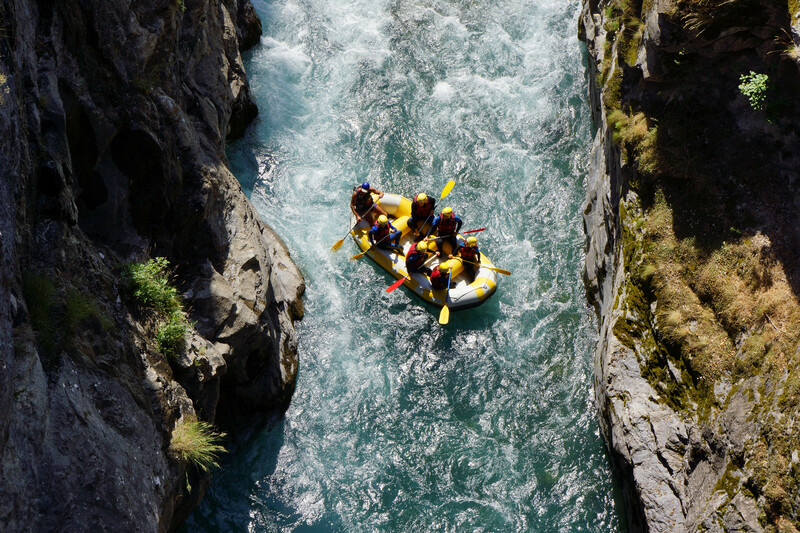 In Le Lauzet Anna went for rafting while I stayed with Dianna, and the next day we managed to find a nanny for her while we took on canyoning!!!!! Canyoning was a lot of fun. While torrents in the Ubaye river don’t offer jumps and slides, the canyon where we were taken was spectacular, with 10-15 meter abseils, some with ice cold water gushing down on your while you try to keep your feet on the rock while abseiling down a waterfall. We were told that canyons close to Nice offer jumps and slides as well as abseiling. We will definitely explore those once we get there. Barceolnette is a very interesting town. 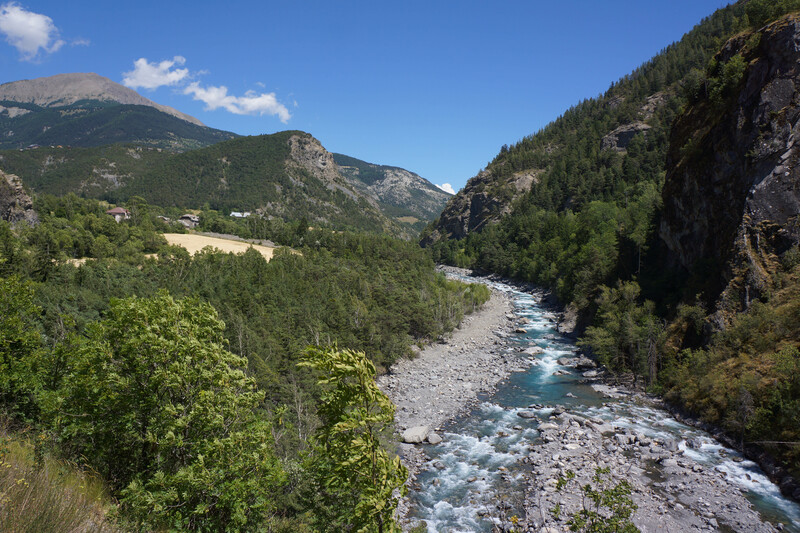 Ubaye valley was, as it turned out, a centre of emigration to the Americas in the 19th century. Emigration was mostly to Mexico. 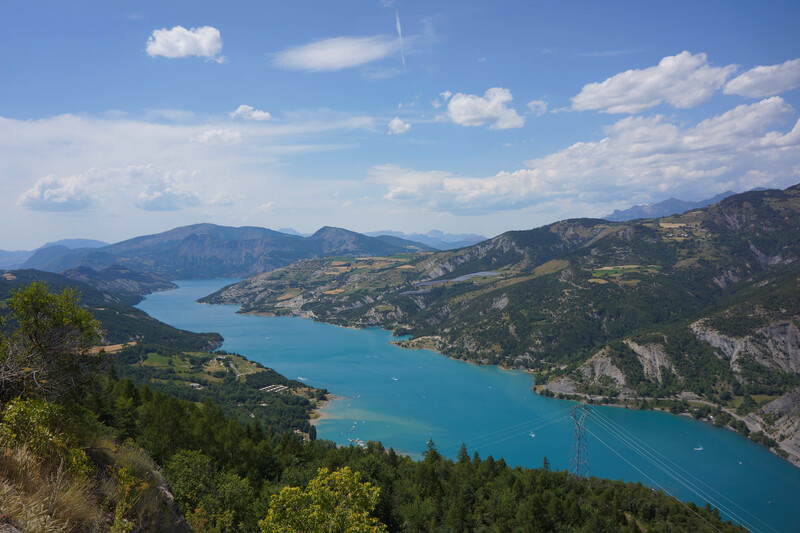 Many have since returned with the wealth and Barcelonette is full of Mexican-style villas. We stayed 2 days in one of those villas (Villa Anita). The Villa is also a home for the Mexican Consulate in Barcelonette!! Amazing. Today was our first encounter with some serious mountains. 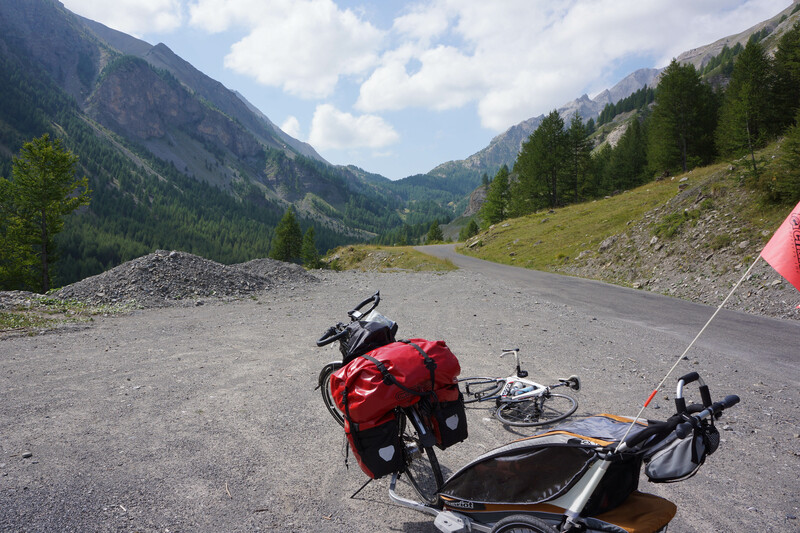 The relatively flat terrain of the massif central (which seemed quite hilly when we cycled there) is nothing compared to the Alps. The route today was short (I was expecting 800 meters altitude gain and was realistic about the time that it’s going to take). We started out of Grenoble at 11am. The first 15-20km from the hotel were completely flat, which alarmed me to what can we expect later on. I knew that it’s 800 meters, however, I thought that the climb will start out of Grenoble and be somewhere around 3-4% in gradient. The climb started at St. George de Commiers (2km short of that village), in blistering heat. 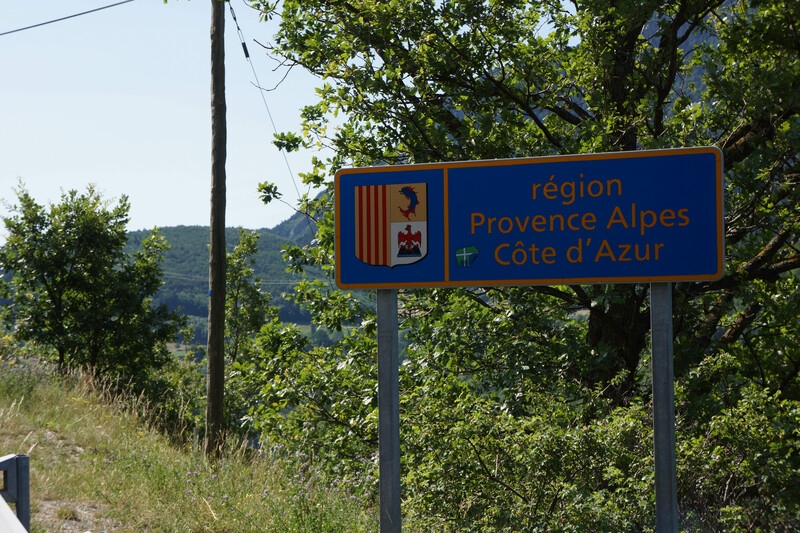 It was a long, relentless slog up a very steep hill (6-10%) on D529 towards La Mure through some breathtaking scenery. 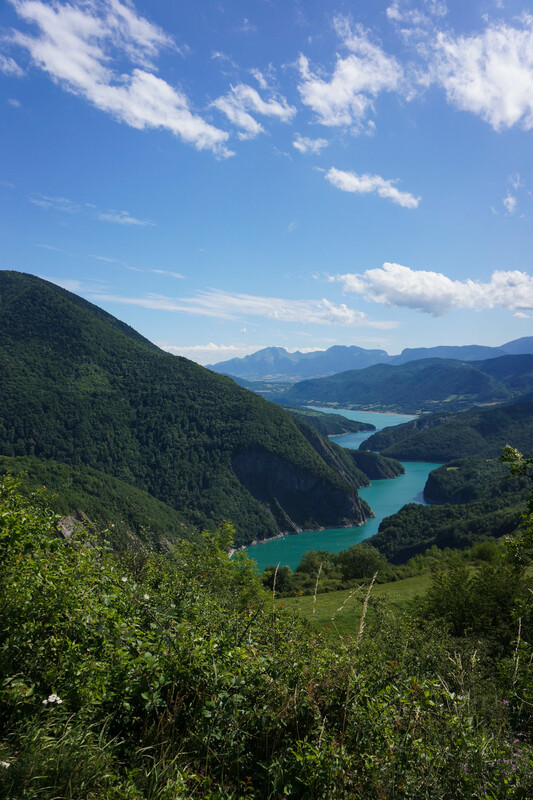 The river Drac, or an artificial lake created on the river was somewhere 300 meters below us filled with turquoise waters. 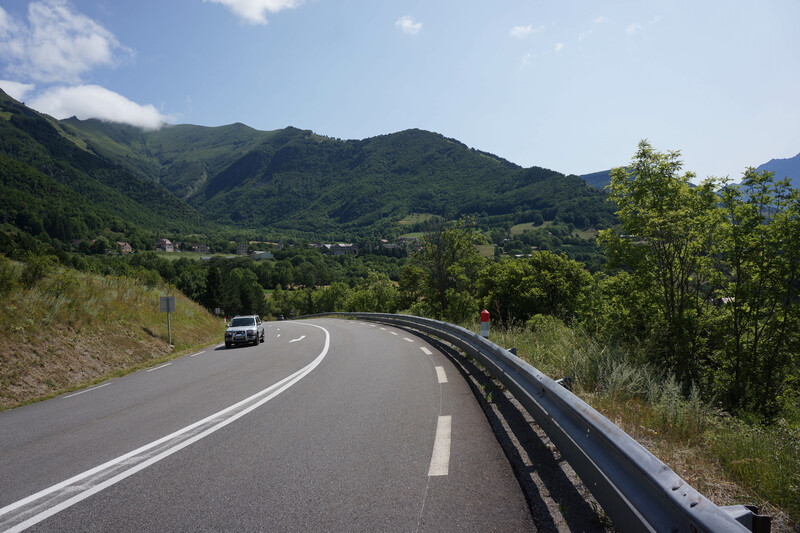 The mountains all around, the fresh wind and picturesque (although empty) villages all compensated for the hilly D529 that set out on a task to get us back to Grenoble 😉 When we passed around 600 meters mark, the air cooled down considerably. We stopped by a water fountain and Notre-Dame Commiers which literally saved me from a meltdown. As soon as we stopped a stuck my head in the water, the feeling was so great! Dianna had a little dip in the cool water of the fountain as well. We stocked up on water and continued towards Le Mott. After about 5km of the climb, I’ve offered to tie Dianna’s Chariot to my bike as it was too hard for Ann to push on. We continued in this setup until La Mure. Around 5km from La Mure there was a Col (unmarked but noticeable) at about 970 meters (we started from 230 meters in Grenoble). From there on it was a long downhill ride from the Col to our hotel.